92 News live is the first HD Urdu news channel from Pakistan. It was launched early of 2015 with headquarter located in Lahore along with sub offices in other major cities of Pakistan. 92 News HD is the first Pakistani news channel which broadcasts with high definition video result. Channel has wide network of reporters spread in 300 cities of Pakistan. Channel’s name is a result of an inspiration took from year 1992 when Pakistan Cricket Team won the world cup title for the first time in the history of Pakistan Cricket and also 92 is a county dialling code of Pakistan. 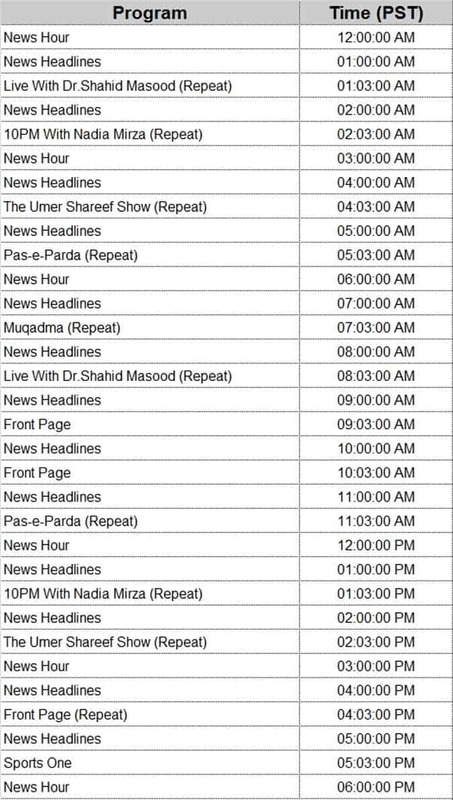 92 News HD in not time got the place among the other top news channel of Pakistan. Mainly this channel has competition with ary news and samaa tv. 92 News HD has the services of well-known and professional news caster, anchor personnel and analysts which give the channel an edge over its other counterpart. With their skills, all these professionals really produce a height quality programming. Team of anchors and analysts of 92 News HD is highly professional and well educated and always provide meaning full, in-depth and close to reality analysis on the basis of true reports come from their reporters spread all over in Pakistan. Khushnood Ali Khan has a well repute in the field of journalism. He is well updated journalist/analyst who often brings insights of today’s top story in his talk show. He an un-biased and in-depth analysis with great authority and fact based. His show broadcasts on 92 News HD live transmission from Monday to Thursday at 07:05pm. Tariq Mateen is a senior anchor person of 92 News HD. Before joining this channel he worked with Dunya News as a news caster. His show Zarai Ke Mutabiq telecasts on 92 News HD on every Friday at 07:03pm. Shazia Zeeshan is a talented female anchor person of 92 News HD. She successfully runs a talk show on 92 News HD live transmission with title of Night Edition from Friday to Sunday at 11:03pm. Prior to this she has worked in Dunya News where she also hosted a political analysis based show. Asadullah Khan came from Express News. He is also another skilled and professional anchor person of 92 News HD. His show called Zair-e-Behas telecasts on 92 News HD prime time transmission from every Friday to Sunday at 08:05. Adil Abbasi is a young, talented and good looking anchor person of 92 News HD. He successfully runs his show called Daleel on 92 News HD live transmission from every Monday to Thursday at 08:05pm. Saadia Afzaal has vast experience of hosting shows on various channels. She started his career with PTV News and prior to join 92 HD News she was hosting a show on AAJ TV. In 92 News HD she runs a show called 92 At 8 which telecast on every Friday to Sunday at 08:03pm. Bebaak is political analysis based program in which famous journalist Khushnood Ali Khan give his expert analysis on today’s top issue. Hina Ira hosts this show on 92 News HD live transmission. Bebaak telecasts on every Monday to Thursday at 07:03pm. Daleel is a talk show in which all the top stories of the day are discussed with invited panel of guests. The show is hosted by Adil Abbasi who is young, talented and professional anchor person. The show broadcasts on 92 News HD from every Monday to Thursday at 08:03pm. Zair-e-Behas is another quality based talk show which hosts by Asadullah Khan. The show has typical pattern of talk show in which panel of 2 or more guests are invited to talk on current hot issue. The show broadcasts on 92 News HD on every Friday to Sunday at 08:03pm. 92 At 8 is a political based talk show hosted by Saadia Afzaal who is very energetic journalist and female anchor. The show is newly started on 92 News HD with typical talk show theme. Shazia Zeeshan presents Night Edition on 92 News HD. It is typical talk show in which couple of guests are invited to have debate on current issue. Night Edition telecasts on 92 News HD live transmission from every Friday to Sunday at 10:05pm. Himaqaten is a comedy show which is enriched with plethora of fun and lot more political debate. This show is actually hosted by Iqra Haris along with Aftaab Iqbal who participate in the show as co-host and analyst. He is famous anchor person also runs most popular show called Khabarnaak on Geo News. Mehmood Aslam who’s famous TV actor participates in the show in multiple getup. The show telecasts on 92 News HD from every Monday to Wednesday at 11:03pm. 92 News HD can be seen in all over Pakistan through local cable and satellite. The channel is also available in South Asia, Middle East, America, UAE, UK, Ireland, and India. 92 News HD live streaming is also available on their official website.